It’s official. 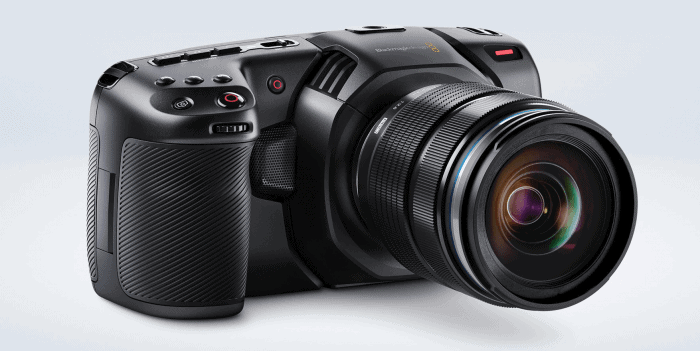 The highly anticipated Blackmagic Design Pocket Cinema Camera 4K has been revealed. And the BMD team gave us pretty much everything, but the kitchen sink. Full 4/3″ sensor. 4K. Dual native ISO (like the new GH5S). 13 stops of dynamic range with 3D LUT support. 5-inch display on the back (fixed sadly). Canon batteries for power. SD/Cfast recording. Prores + BMD RAW (hopefully eventually support for Apple’s new ProRes RAW. Same OS as Ursa Mini Pro (great touch UI). Design is definitely DSLR-ish, and not in the tradition of the tiny original Pocket — this is not necessarily a bad thing. HFR: 4K/60 and HD/120 (windowed) internal. USB-C port for power or recording to external SSD (nice!). Lockable power port. Mini XLR with phantom power. 4 built-in microphones. Full-size HDMI connector. And a DaVinci Resolve Studio License… a nice, added bonus, worth $299 if purchased separately. 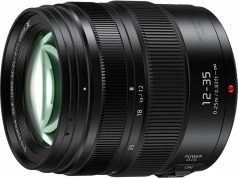 Shipping September 2018 (I’d say 50/50 chance given Blackmagic’s record in hitting ship dates). Verdict: winner! 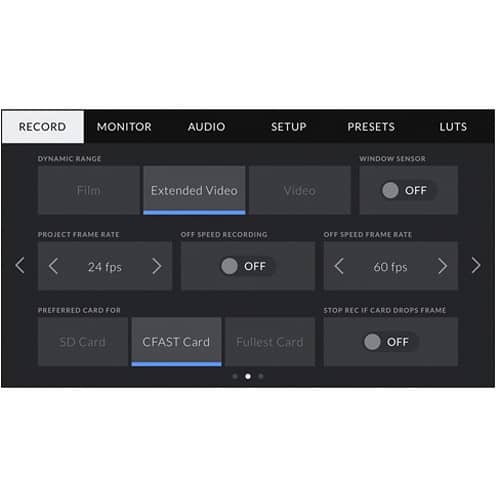 I’d say this, along with Apple’s ProRes RAW, are the 2 biggest NAB Show 2018 highlights for budget and indie filmmakers. If all turns out, I’d definitely use the Pocket 4K for Stark Insider travel videos and other times we need a compact form factor to be discreet. It could be so-long GH5… maybe. 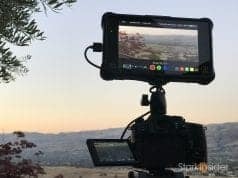 RedShark News: The 4K Blackmagic Pocket Cinema Camera, quite probably, changes everything! You can now pre-order the Blackmagic Pocket Cinema Camera 4K on B&H Photo for $1,295 (USD). My order was placed in a nanosecond; so many features for such a comparatively low price! Our cinematic dreams are coming true. 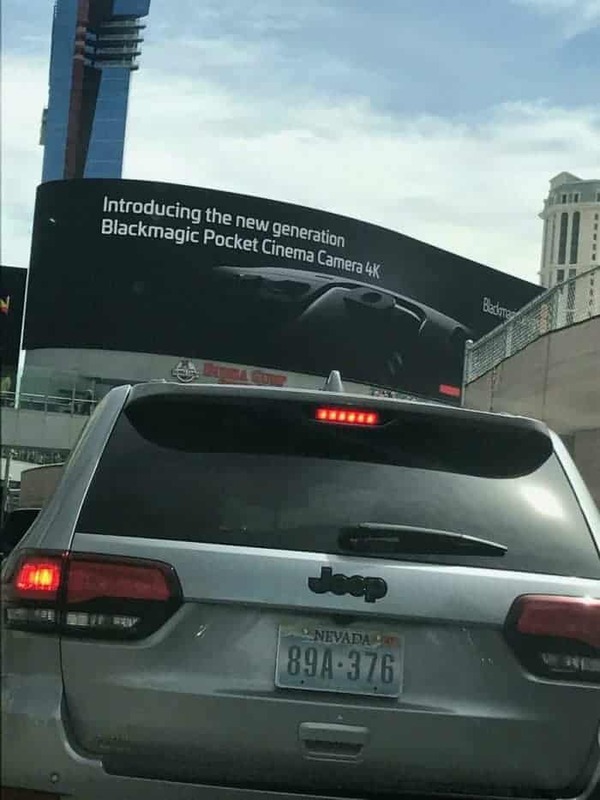 Photos out of Las Vegas today show a huge billboard teasing a new Blackmagic Pocket Cinema Camera 4K (via RedShark News). If true, this could be big news. The original Pocket camera became a darling among budget videographers and filmmakers. Small form factor, option for RAW file capture, built-in LCD screen, and outstanding — dare we call it “filmic”? — image turned the Pocket into a sensational hit for Blackmagic. At only $995 (USD) it was utterly amazing value for the money. That many still use it today is testament to its forward-thinking specs and design. Given that’s it 2018 and the 4K train has departed, the faithful had long hoped Australia’s Blackmagic Design team would give the little camera attention and release a sequel with updated specs. That day is near. 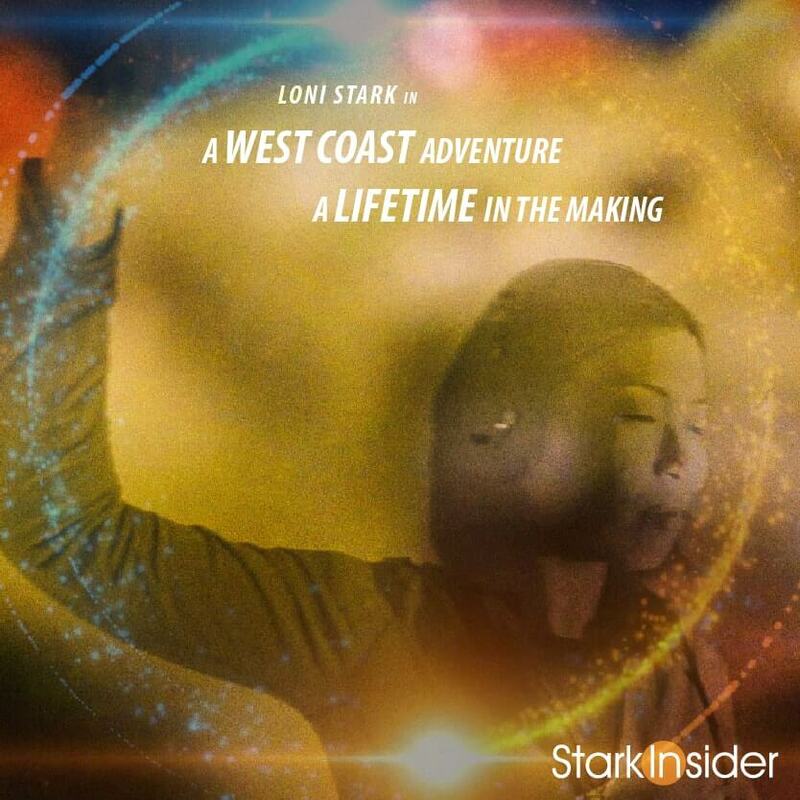 On its Facebook page, BMD says it will hold a press conference on Monday, April 9, 2018 at 9:30am PDT where surely all the details will flow. 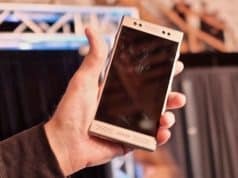 Here’s hoping that in addition to 4K the engineers have found a way to give the Pocket better battery life and a more legible display in bright light. Yes, isn’t that always the way? More, more, more. Either way, along with Apple’s ProRes RAW announcement, this NAB is turning out to be a solid one for camera and video nerds. 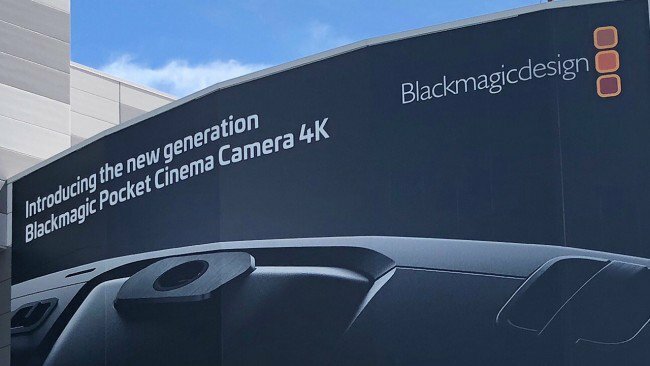 Blackmagic Pocket Cinema Camera 4K teaser poster spotted in Las Vegas in advance of the NAB trade show. 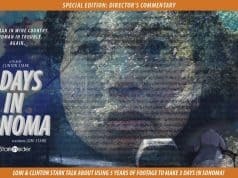 I used the Blackmagic Micro Cinema Camera on several projects for Stark Insider over the past few years. It’s an interesting camera; sort of like the Pocket, but without the built-in screen. Recording to cheap SD cards and with a beautiful sensor it produced outstanding results — even if ergonomically is was far from something like a GH5 or plan old DSLR camera body. Many of the scenes at the “Magical Retreat” just north of San Francisco, under majestic redwoods, from our SI short 3 Days in Sonoma were shot with the Micro. I especially like that its Super 16-sized sensor made it a match made in heaven for the famed vintage Angenieux 12-120mm lens. A modern day equivalent might cost around $75,000. In other words: prohibitive. But I picked one up for about $600 on eBay. Though it’s from the 1960s the optics are very pretty to my eyes. And I can crank away thanks to a handle. So I can get — or try to get — De Palma style superzooms. And that’s what I tried to do for a few of the scripted bits in 3 Days in Sonoma. Magical Retreat scenes shot (when stuffed animals attack for instance) on Blackmagic Micro Cinema Camera (BMCC) with Agenieux 12-120mm lens, Sigma 18-35mm and Lumix 12-35mm. Videos below jump to 2 sequences shot on BMMCC with a vintage Angenieux 12-120mm lens. Cranking that manual zoom for joy. All that to say, it will be very interesting to see what Blackmagic does with the Pocket 4K. The original Pocket was already a legend amongst the filmmaking community and bloggers, so here’s hoping the company shakes up the industry once again! 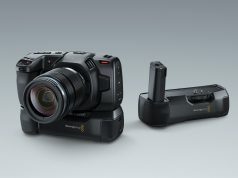 Lead Photo of Blackmagic Pocket Cinema Camera 4K: Courtesy RedShark News.